Missing out on technology innovation could cripple any business or leave it at the mercy of rivals. This makes keeping up with the latest IT trends a vital business effort. Most small and medium-sized businesses focus firmly on their day-to-day operations. With only a small amount of time to focus on the technology that helps keeps the lights on, the blur of IT and technology innovation can pass them by. However, there are ways that any business can apply some focus when it comes to identifying and making use of the latest technology trends to benefit the company. Technology trends affect every business to some degree. From sweeping legislative changes like the General Data Protection Regulations (GDPR) to the rise in the use of chat bots, the impact can be subtle yet substantial. However, while most vendors might heavily promote nebulous terms like “big data”, it can be hard for an individual company to see a pressing use case. Even so, the benefits are there. With the majority of companies large or small taking advantage. New cloud services from accounting to office apps help businesses reduce costs and grow faster with reduced overheads. The much-heralded Internet of Things provides a new ecosystem of information and feedback, while even updating office phones to a unified communications suite makes businesses more effective and better at communicating. Even traditional IT business areas like cyber-security are always on the move, and businesses need to keep up with the evolving landscape to protect its assets. The benefits are not only monetary. Putting a customer service chat bot on your company Facebook page or website can save time and free up your agents to deal with more complex queries. That time saving is extended as it makes those agents feel they are doing more valuable work, therefore aiding retention. All of which adds up to multiple benefits from a relatively simple and low-cost addition. Artificial Intelligence is probably the hottest trend in IT at the moment. Combined with big data, an AI can spot patterns that are hard to identify among vast data sets, without weeks or months of hard analysis by costly experts. These patterns can save revenue when it comes to making buying adjustments, identifying security threats or anomalies, or predicting whole new trends. AI also helps better match customers with the products they need, and help refine operations to smooth business processes. For marketers, augmented reality (AR) is another hot trend. It enables stores, music acts, brands and others to highlight their products in new and exciting ways. At a practical level, AR can also help any business create better instruction manuals, or provide technical help and support. Since so few people read the manual, if there is one, visual help is rapidly becoming a key part of any support system. For most businesses, especially those deeply focused on current operations, the maxim that reading never hurt a business leader is especially true. Taking time out to find out what is going on among your competitors in the wider market is vital for any company. It doesn’t have to be the CEO doing the reading, but someone must be tasked with regularly reporting to the leadership on IT developments that could have an impact. There is plenty of free comment and research available online, while attending trade events is a great way to find out what people are talking about that might not be splashed across technology news pages. Even following your vertical or industry leaders, peers and so-called thought leaders on social media is a non-time-intensive and useful way of keeping track of the latest trends in technology. Seasonal pieces like business tech trend articles are a good indicator of what may happen in the immediate future. But, the key indicator for any technology comes when it passes the early adoption phase and you notice rapid usage by rivals. 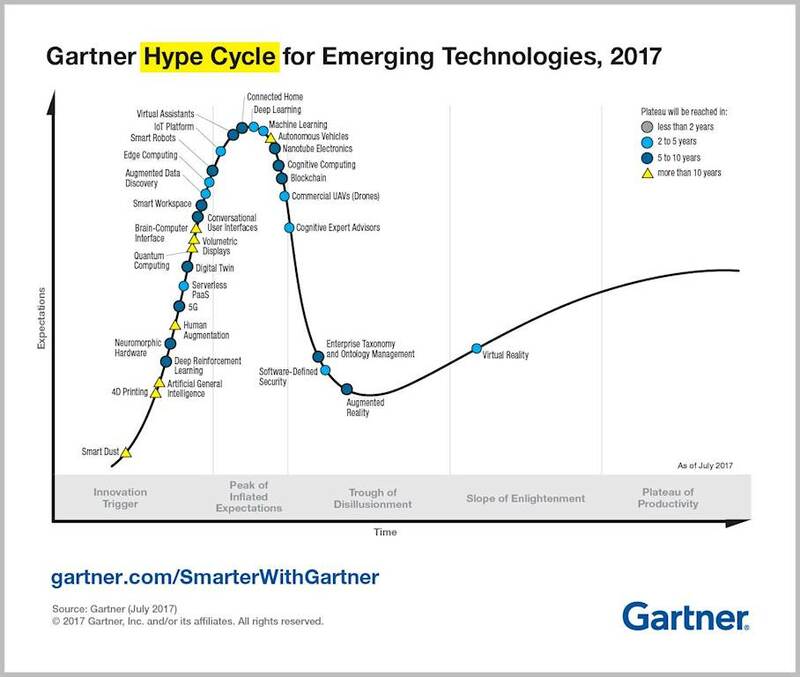 The Gartner Hype Cycle identifies the current position of technology trends and innovations to track the maturity of the technology and its potential in the future. The 2017 model below can help businesses better understand the current technological landscape and what this means for the future. Your business might not be able to afford the investment or time to leap on a trend early. But, by being aware of it and preparing for its use, your business can be ready to switch over to it when the time is right. The benefit of this is that most early wrinkles in vendor products have been ironed out and the key use cases that any business can benefit from will have been established. There are endless technology trends at various stages of evolution and development. Something like blockchain might sound esoteric, but the trick is always to focus on how it could impact your business or market. Blockchain has rapidly moved on from a banking concept to reaching far wider uses. It is already helping those in supply chain, authentication and other lines of work with just a little development of the original technology’s use. Another trick is to look at where technologies can merge to create a stronger product. We already see AI being bolted into what were once script-based chat bots to help them learn on their own, become smarter and be able to address a far wider range of questions. Whatever the business, taking some time to focus on the trends that could help your teams work better or smarter will be time well spent. Understanding how those trends will change your line of work will make the company better prepared for the inevitable. Also, casting a cynical eye over marketing and obvious gimmicks will help avoid jumping on an expensive bandwagon. Consider cryptocurrencies where endless new products launch on hype alone with next-to-no-business value, praying for a Bitcoin-like price rise. Some 99% of businesses have no use for creating a coin-like product or partnering with an existing one. When the time comes to do so, it will be a product that is at least comprehensible to business leaders without an MBA in gibberish.